I’ve been pretty obsessed lately with trying out pastry recipes and making them a little more friendly for folks like me who have to be cognizant of their blood sugar. Pastries, especially sweet ones are synonymous with carbohydrates (the pesky nutrient that causes spikes in your blood sugar). I really like making doughnuts (they’re one of my most popular recipes! 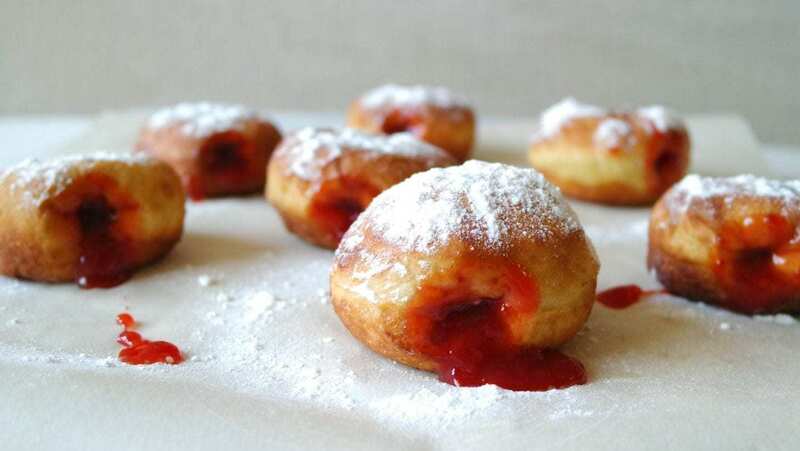 ), and the sufganiyot are one of the best recipes for puffy, sweet, jelly-filled pastries. Sufganiyot have a significance in the Jewish faith. At Hanukkah, Jews observe the custom of eating fried foods in commemoration of the miracle associated with the Temple oil. This pastry dough is excellent for regular doughnuts too! If you want a classic, glazed, Shipley’s doughnut, this is about as close as you’re going to get to that dough. The first time I ever made Sufganiyot, I thought I initially ruined the dough because it’s so sticky, and tacky that I thought I must not have added enough flour, or I added too much liquid. Those are absolute signs that you’re on the right track with the dough, but you’re going to need a lot of flour for your pastry board, and your rolling pin because this dough really sticks to everything. I tried something a little different. These pastries are deep fried and there’s no way around it. I actually went with olive oil for the deep frying process instead of using canola oil, or peanut oil. I know what you’re thinking – Olive Oil has a low smoke point and is usually not the best for frying. While this is true, these can be done on a medium temp stove. You won’t get too much smoke while frying these. I used a sweet olive oil from Zucchi to fry these – I also used a tablespoon of the oil in the dough instead of melted butter. It worked really well! The last thing I’ll say about this recipe – you probably see sugar sprinkled over the top and you’re thinking “You can’t be serious – a diabetic sharing a pastry recipe with sugar sprinkled all over the top?” Well, you got SWERVED. Swerve is a no-calorie sugar replacement, and holy crap – it’s better than amazing. Read more about it here. Check out the recipe below, and let me know what you think! Next time I make them, I would love to stuff them with a good custard, or creamy chocolate. Link your recipe below if you have one. Confectioner\'s sugar, or sugar substitute for sprinkling over the top. In a gallon-sized plastic bag, add the yeast, warm water (heated to around 125-135 degrees), sugar, lemon vodka, lemon zest, Olive Oil, egg and flour. Zip bag and mix ingredients well. Place bag in another bag, and then into a bowl of very warm water for 1 hour. Remove dough from the bag and onto heavily a floured surface. The dough should be sticky, which means you\'re on the right track! Roll out the dough to 1/2 inch (1 cm) thickness. Make sure both sides of the dough are floured, so it doesn’t stick to the surface. With a cookie cutter or drinking glass, cut 2-inch circles in the dough. When you are left with scraps of dough, roll it out again and cut more circles. Cover the cut-outs with a towel for 30 minutes. Fill a pan with 2 inches of olive oil. Heat oil to 350F/175C. Depending on your stove, the correct temperature will be around medium. You will know if it’s correct when you add the sufganiyot. The oil should bubble around the sufganiyot, but not a ton of bubbles. Fry the doughnuts for about 2-minutes on each side, or until golden brown. Remove and place on cooling rack or plate with parchment. 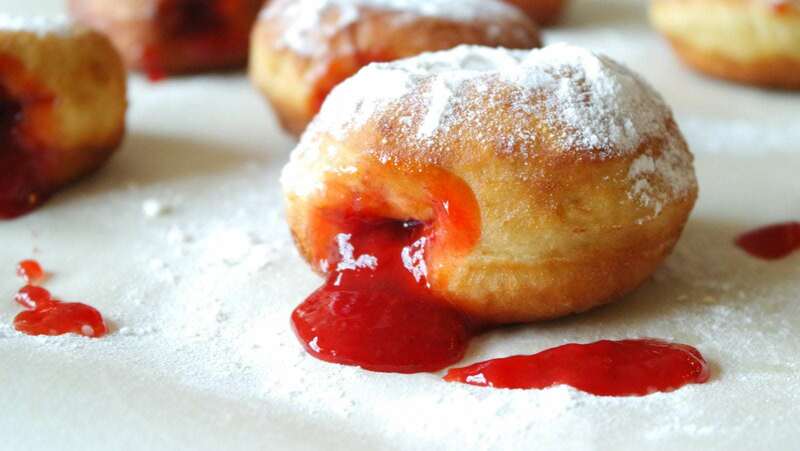 With a squeeze tube or piping bag, add your favorite jelly or jam to the doughnuts. Just make sure the jelly/jam isn’t too chunky to squeeze through whatever you’re using. Sprinkle with powdered sugar, and enjoy. 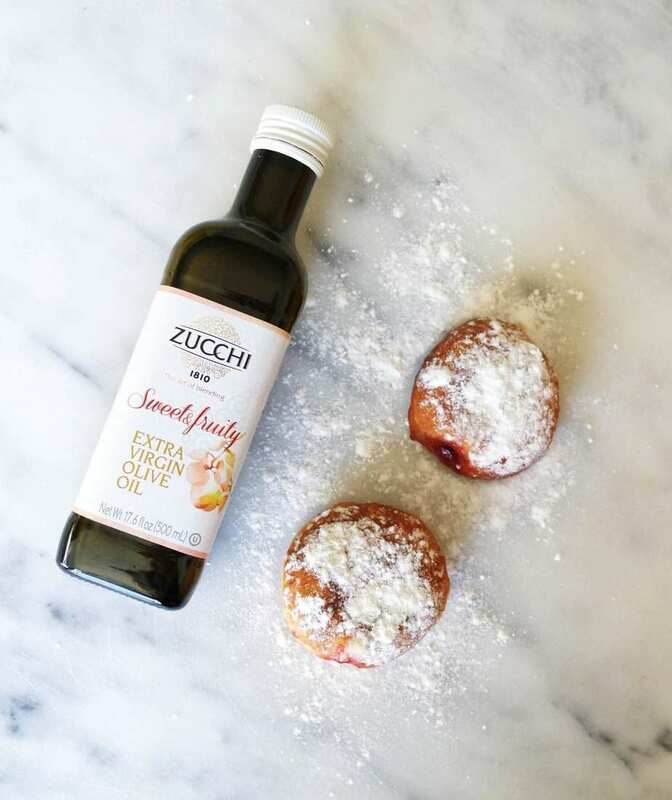 Zucchi Olive Oil sent me a few bottles of their Olive Oil to write about. While I received the product for free, all opinions are my own, and I only include products in my post that I love, and you might like to know about. This looks all sorts of YUMMY! Ah I love that i’ve not only learned a new recipe but also about a Jewish traditions. Exciting! 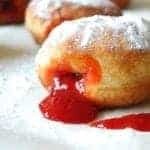 Jelly Doughnuts are the best sweet treat, especially for the summer! My little guy would enjoy these! Yum! These look addictive–I wouldn’t be able to eat just one! This looks so good. I am so trying this next week. Putting in on my grocery list. Thanks for sharing this recipe! I also love that you shared the history behind the recipe, so interesting! These look delicious and seem simpler than I thought! I’ll have to add these to my holiday baking! Thanks for posting! These look amazing!! I love doughnuts, maybe something for the weekend! This sounds so yummy! I’ll definitely have to try it for myself. Oh my gosh!!!! THESE LOOK phenomenal! Like something the PROS would make – that being said, this is the first time I have ever been to your blog so…. You could in fact be a pro baker/pastry chef! YOU WOW ME! Oh wow! These look incredible! Love the tip about frying these in olive oil. I have never tried that but I love the flavor of olive oil more than canola oil so I wanna try it out soon! My pregnant belly needs those now! Those look so amazing!